If you have the wrong solution for resolving traumas it is possible to work very hard and still find little relief from the struggle. Many solutions that have been tried over the years are not completely wrong but can use up precious resources ineffectively. Catharsis (getting your feelings out) – Trauma is NOT resolved by expressing my feeling strongly enough. Resolving traumas does free me to express my feelings but that is not the point. For trauma to be resolved, I need to express myself in the very moment of the feeling so that the intensity of the feeling no longer makes me forget who I am and how I like to be and act. Remembering/knowing what happened to me – Trauma is NOT resolved by remembering or knowing what happened to me. Many people who remember what happened are still traumatized while others have recovered without being sure what really happened. You will not be able to resolve traumas that are too overwhelming to remember if your control center capacity is too low. Being able to remember only indicates sufficient control center capacity to face the remembered emotions. Taking through my trauma – Trauma is NOT resolved by talking or even putting my traumatic experience into words. 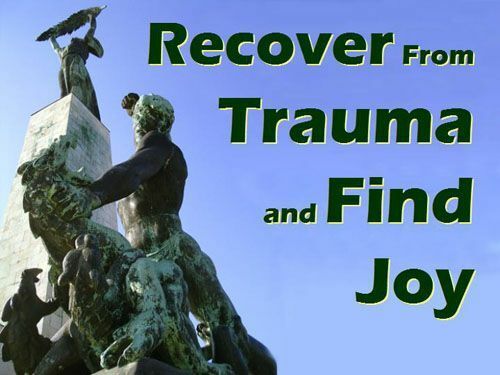 Being able to give a narrative about severe traumatic experiences is one sign of progress in recovery but it is a sign of recovery not the cause of the recovery. Correcting my thinking – Trauma is NOT resolved by changing my beliefs or cognitions. Changing your thoughts can dramatically change what you do to produce recovery but the brain is not configured in a way that gives your thoughts control over the trauma response. Abreacting the original traumatic event – Trauma is NOT resolved by reliving (reenacting physically and emotionally) the traumatic experience. By itself, abreacting only gives me another chance to go through the terrible experience. To be resolved I must achieve a mutual state of mind with another person in the midst of the experience that will lead us to acting like ourselves (maintaining a relationship), quieting together and then find meaning for me in the experience by discovering how God sees me at that moment. It has been our experience that people who focus on remembering and reliving their early-life traumas in the hope of recovering actually tire themselves excessively. They can become more depressed, suicidal, more prone to self mutilation and hospitalization, tend to develop fibromyalgia and chronic fatigue syndromes, sleep poorly, drift toward isolation and peculiar views of reality while their quality of life does not improve. Increased contact is mistakenly given to people suffering from Type A trauma to replace what has been missing all their lives. Intense care is often provided to reduce the traumatized person’s pain. This inevitably has the opposite effect. Pain increases as the care is accelerated, driven by rising levels of attachment pain, overwhelm and distress. Contact becomes more intense, more intimate or more prolonged in the hope of reducing the attachment pain (loneliness, rejection, abandonment, desperation, overwhelm etc.) During this time the helper and traumatized person are hoping for some kind of breakthrough for the Type B traumatic events. Breakthroughs do not bring lasting wellbeing and usually start the next crisis cycle. The search for breakthroughs is fundamentally flawed in two ways. First is the belief that, “If I get to the bottom of this I will be free from pain.” Secondly, working for breakthroughs focuses the person on their painful memories and diverts them from building permanent relationships capable of improving the quality of their functioning. The resolution of traumas does not produce freedom from pain but rather the capacity to suffer well and stay in relationship with others and God in the presence of emotions and pain. 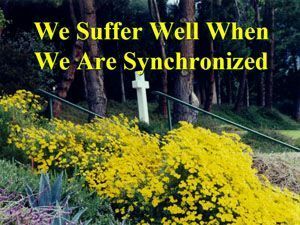 The notable characteristic of suffering well is the peace one feels during the painful moments and quiet that comes afterwards.